#1 on iTunes in multiple countries. #1 trending topic on Twitter worldwide. 5 million views on YouTube in 48 hours. 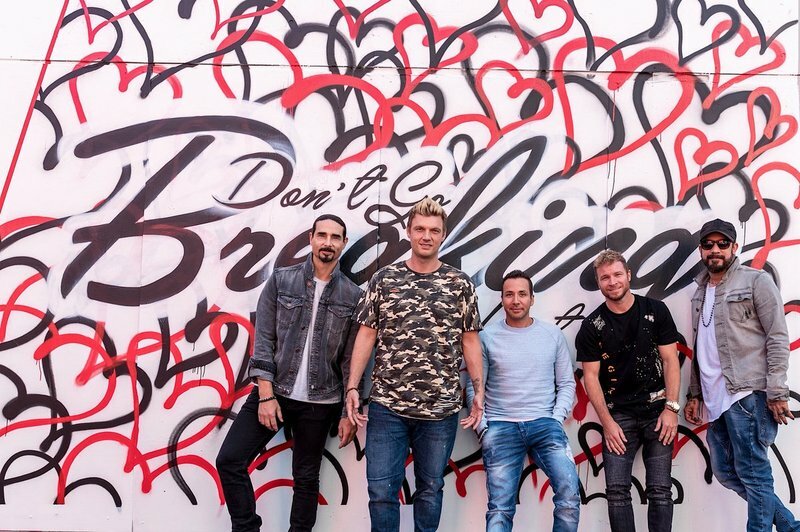 These were just a few of the accomplishments the Backstreet Boys have reached with their new single, “Don’t Go Breaking My Heart”, in less than a week since it’s highly anticipated release. As the song released worldwide, more and more tweets and social media posts rolled in from not only fans, but notables like Robbie Williams, Robert Irvine, Zach Ryder, Jeff Timmons, and Seth Rollins. The positive reviews didn’t stop there. Entertainment Weekly called it a “shimmering pop jam”, “a romantic house-inflected new single” by Rolling Stone, and Marie Claire predicted “you probably will have this song on repeat all summer long”. The radio-friendly jam was written by Stephen Wrabel and produced by Jamie Hartman and Stuart Crichton, who sent the song to the group after attending one of their shows in Las Vegas a few months ago. Shortly after the midnight release, Kevin, Howie, Brian, AJ and Nick headed out to promote their first single in five years. The Boys stopped in to chat with The Zach Sang Show, iHeartRadio, Ryan Seacrest, Ellen K (where they also played Guess That Tweet), Mix 105.1 Orlando, 94.7 Washington DC, and more, proving that they remain one of the hardest working bands in the industry, even after 25 years. You can also check out this interview with Entertainment Weekly for a little more insight about what the Boys have planned next. Oh, and before the single even dropped, the Backstreet Boys dropped in on an unsuspecting BSB-themed spin class at FlyWheel in LA. See the photos here! After all of this, the five flew back to their second home in Las Vegas, where they will be doing a new string of shows at Zappos Theater starting in July, to perform “Don’t Go Breaking My Heart” for the first time live at The Cosmopolitan’s SPF 2018. You can watch a video of the performance here. So, how can you keep supporting the new single? You can find a link here that will direct you to everywhere “Don’t Go Breaking My Heart” is available for download and streaming here. Share it with everyone you know and keep streaming everywhere you go (because you can’t get enough, right?). Don’t forget the music video either! You also might have seen the #DontGoBreakingMyHeart mural in L.A. on the Boys’ Instagram pages a few days ago. Fans in the area are highly encouraged to go snap a photo of yourself (and your friends) at the wall, post it to social media tagging the Ogden And Melrose location and using the DGBMH hashtag, to show your love for the new single. (Psst! One lucky person who posts their pic will be chosen to win a pair of meet and greet passes to the BSB Vegas show of their choice. A winner will be chosen on May 31st.) The mural will be until up June 1st so get on it while you can. You can catch the single performed live at several radio shows this Summer, including KTUPhoria, which was JUST ANNOUNCED on Thursday. Tickets are on sale now – get them while you can. Are you into “Don’t Go Breaking My Heart”? Leave a comment below and stay tuned – we’re only getting started on an epic year for the Backstreet Boys!